As many of you may know, my littlest man has an egg allergy. A total bummer if you ask me. Especially since we have our own chickens that lay for us. so I try to find alternatives for him. 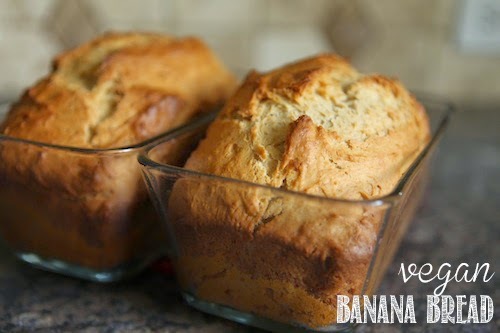 and decided to whip up some vegan banana bread with them yesterday. If you are vegan or dairy sensitive, it's totally worth a try! Mash well ripened bananas in a small bowl and set aside. Mix sugar, flour, baking powder and baking soda. Add mashed bananas and oil to mixer. Mix well. Add flour mixture. The batter will be very thick. Add your preference of milk now. Spoon ingredients into two greased loaf pans, or muffin tins. Bake in preheated oven at 350 degrees for approximately 55 minutes for loafs, and 20 minutes for muffins. Insert toothpick to check if done. Once they are cooled, remove from pan and put them in a big ziploc so they won't dry out. Without the eggs they aren't quite as fluffy, and a little more bread-like. Still yummy though, and a total plus that my little man can eat it! Throw some chocolate chips in there and we're in bizz. Yum. I second the chocolate chips but I also wonder if it would be more moist if you used applesauce in place of the oil...I use it in my recipe and it's always yummy. this looks amazing. yum yum yum. When I tried to do a cleanse a few months ago the main thing I kept craving the whole time was banana bread. It was weird, but I'm happy there are healthy, vegan versions out there to try. Thanks ! Oh my goodness, yum, this sounds delicious!